I think as a SuppVersity reader you know by now that "more won't yield more" - no matter if we are talking about supplements or exercise. Now, while we've had countless examples of the "more ain't more" principle that's also at the heart of the "Three Simple Rules of Supplementation" (read article) for supplements (e.g. zinc, chromium, etc.) and the simple notion that eating less won't always result in greater weight loss, evidence for the pro-anabolic / adaptive effects of exercise in general, and non-steady state cardio, in particular is scarce. Against that background it's all the more important for us to cherish the publication of a paper from the Norwegian University of Science and Technology and the St Olav University Hospital in Trondheim Norway, Roy told me about by messaging me via the SuppVersity Facebook Page. "More HIIT doesn't help more, either"
I guess the above would be the elevator pitch for the mythical "turbo lift" in Star Trek. 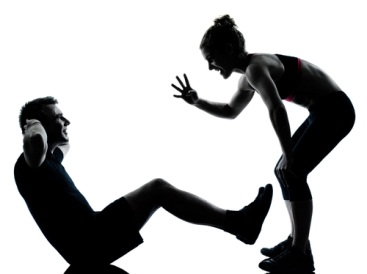 For someone like yourself who has learned never to swallow "expert" wisdom just like that, the statement "more HIIT doesn't hep more, either" obviously won't be satisfying. Figure 2: Illustration of the training in the low frequency (LF) and high frequency (HF) group. ... adapatation takes time and training more often does not accelerate this process! In the end, I am actually quite surprised to see that the net VO2 "gain" the scientists measured in the subsequent detraining phase (see Figure 2) was identical. Or, more explicitly, that packing 24 training sessions into three weeks did not blunt the mitochondrial adaptation processes that are responsible for the increase in VO2max, altogether. If we are brutally honest, though, there is obviously an advantage for the 24 sessions in 8 weeks version of this training protocol (see Figure 3, as well). The VO2max scores were after all identical only in the "catch-up" up period in week 11 and due to the rapid decline after week 12 the benefits faded equally rapid in both groups when the 19 healthy, normalweight, but non-athletic subjects returned to their usual laziness (detraining = not training at all). 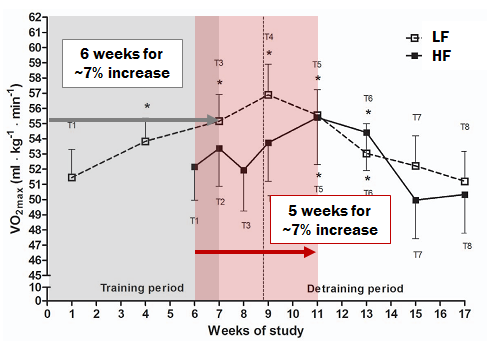 Bottom line: If you are pressed in time, a short phase of very frequent training can bring your conditioning up faster (5 weeks vs. 6 weeks; see Figure 3). For an athlete who may react slightly different to this kind of protocol than the average Joes in the study at hand this one week could decide victory or defeat. For someone who is in this for life - a true physical culturist, so to say - HIITing it everyday is not just madness, it is also very likely to end up producing the previously hinted at detrimental performance (and later on health) effects, as soon as this brief episode of overreaching becomes and endless nightmare of overtraining.